To start testing VW, Audi, Skoda, or Seat Run AutoHex Scan Tool program then click on VW Icon, the VW program will start as shown in the picture. 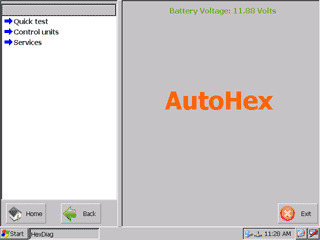 Quick Test: use this function to make a quick test to all Ecus in the tested car. Control units: use this function to test specific Ecu, like engine, transmission, ABS, airbag,…. Services: Many cases you don’t need to do diagnose for the car, but some services, like oil reset, change language, … you can find such functions here.